Carolyn doesn’t know this (yet), but I almost didn’t go to Boone. Who’s Carolyn, you ask, and what was in Boone? 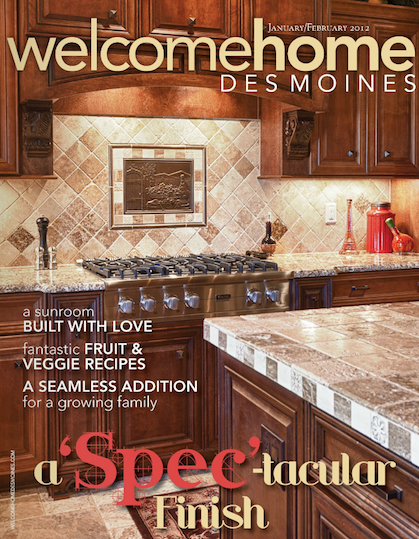 Check out the “Built With Love” feature in the January / February 2012 edition of Welcome Home Des Moines magazine for the answers. Thanks to Sherry Failor and her Welcome Home Des Moines staff for the very fine coverage. And, a very special thanks to Carolyn for allowing us to be a part of her project. For reasons I can’t entirely explain, I almost declined Carolyn’s invitation to participate in her 4-season room project. But once I got there, I couldn’t leave. Literally. Carolyn’s is the only yard I’ve had to “break out” of from a design consultation visit. I was certain her neighbors were going to have me arrested as I scaled the 6’ privacy fence surrounding her back yard. I was also certain I was going to be attacked by Carolyn’s two dogs and freeze to death if I didn’t risk that Great Escape. Needless to say, Carolyn’s sunroom project had a tenuous beginning for me. But, that paled in comparison to the beginning the project had for Carolyn. Plus, I was joking about the dogs (they are nice…and were inside…which makes them nicer). Not that we take any of our Des Moines-area outdoor living projects lightly, but I soon realized there was more riding on this project in Boone than most. Not so much from complexity or scope or material or dollars or anything you’d normally associate with a project of this nature. But rather…from emotion. Gut-wrenching emotion. 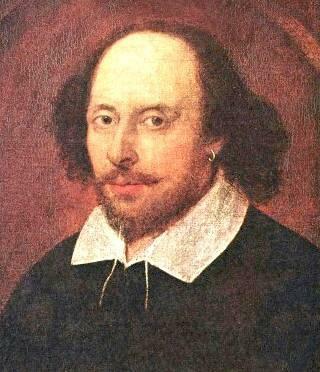 From life-altering events that can make one question the very meaning of life. And you want to build a room from that? year, I can’t help but see…in many different ways, for many different reasons…that homes are important. 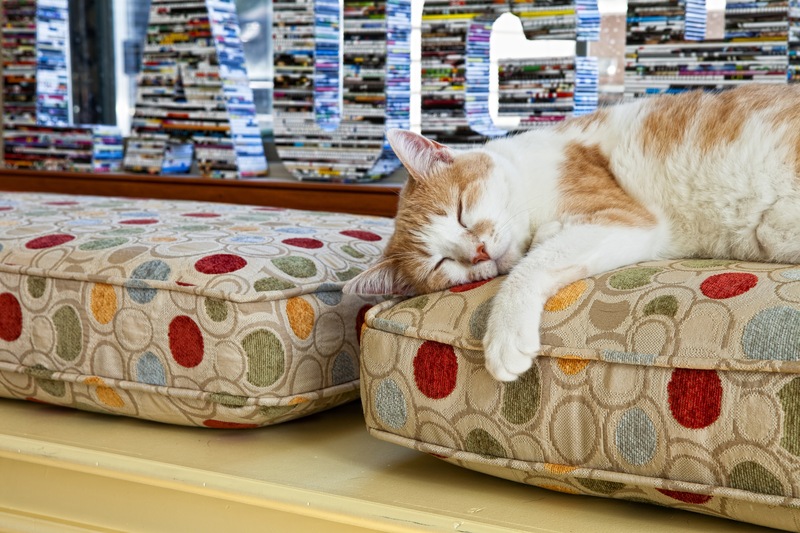 Like Carolyn, my wife calls “home” her “sanctuary.” What you do and put into/around your home is important. How you use your home and its surrounding spaces is important…to you, your family, your lifestyle. My Archadeck experience has taught me many things, not the least of which is that what we, as Archadeck, are doing is important from that perspective. I don’t take that responsibility lightly. In my own family, we’ve seen a situation similar to Carolyn’s…a wife, a mother, a family…losing a husband, a father…to an uncontrollable illness…at an inexplicably early age…left to maintain a family…maintain a home. Unfortunately, Carolyn and my sister-in-law, Julia, are just two of countless stories like this – I’m sure you have your own. But, these stories often also highlight the strength of the human spirit – and that inspires me – and hopefully you, too. As I told Carolyn recently, her project goes beyond words for me. As shown in the photos below, Archadeck provided the sticks, glass, stone and the plan to put it together. But, Carolyn made the room. Carolyn provided the inspiration. Of course, I want to build a room from that. 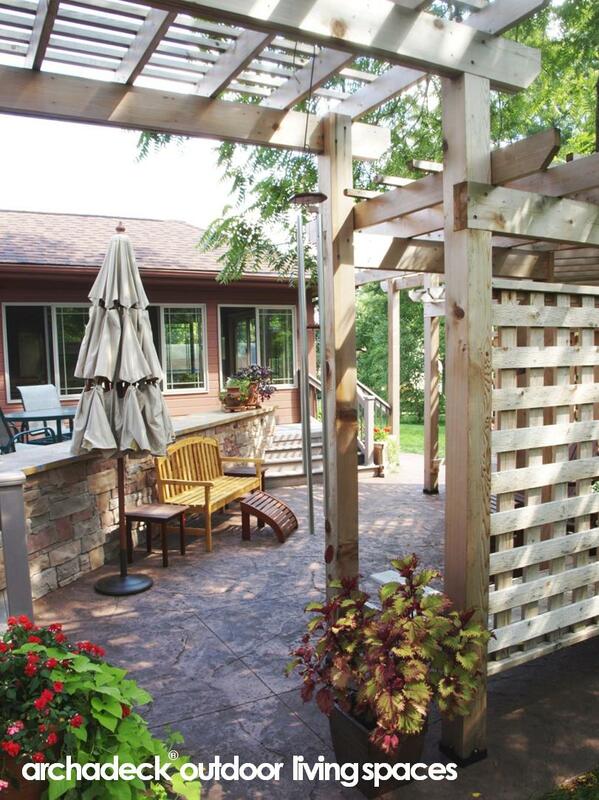 So much to talk about…so little time… …so many Des Moines area backyards to enhance. And a couple of front ones as well. Spaces, Rooms and Accessories for Outdoor Living: We’re seeing more and more interest around the Des Moines area in “combination” projects…decks and patios, patios and pergolas, screen porches and decks, decks and 4-season rooms. And more! I’ve written often about Archadeck being more than a deck builder…much more. And this is why: you want more. You want outdoor living spaces, rooms and accessories. You want a plan that brings those together. You want a developer you trust to put it together. You want to feel secure in your decision to invest in your home. 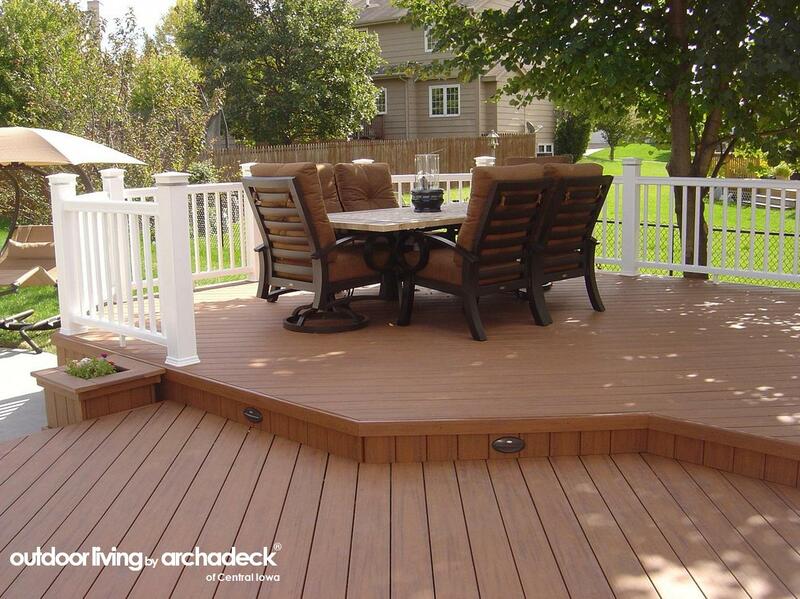 Archadeck makes that happen through our integrated processes for designing and building outdoor spaces and our warranty and guarantee provisions. Better Building by Design: As outdoor living projects grow in scope, design becomes more important. We’ve always taken a “custom design” approach to our projects. Sometimes folks are surprised by this…not expecting the detail necessary in developing your perfect space…not realizing how much of a difference it will make in the outcome and in the decision-making process. All before a single board is ordered, cut or screwed! To take that “surprise” effect away, we’ve developed a complimentary Design Guide to give you insight into the factors you should – and we do – consider for you project. 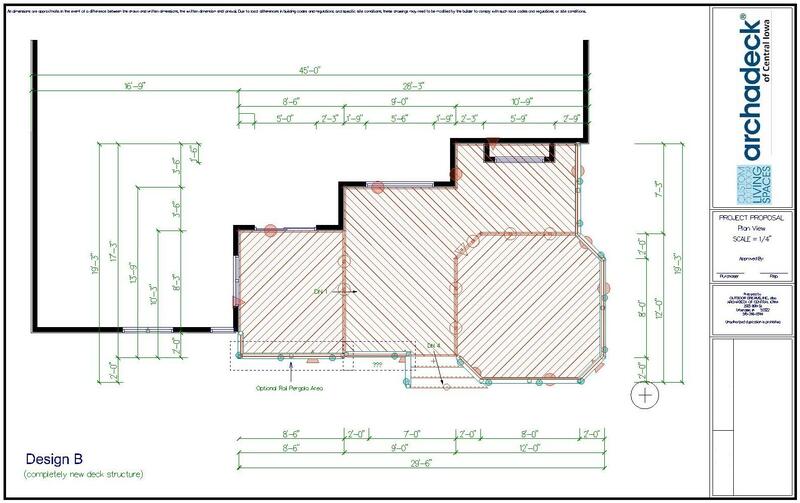 You can review the Design Guide before you even contact us for your complimentary design consultation and by doing so help facilitate the design process as you move forward with us with your project. 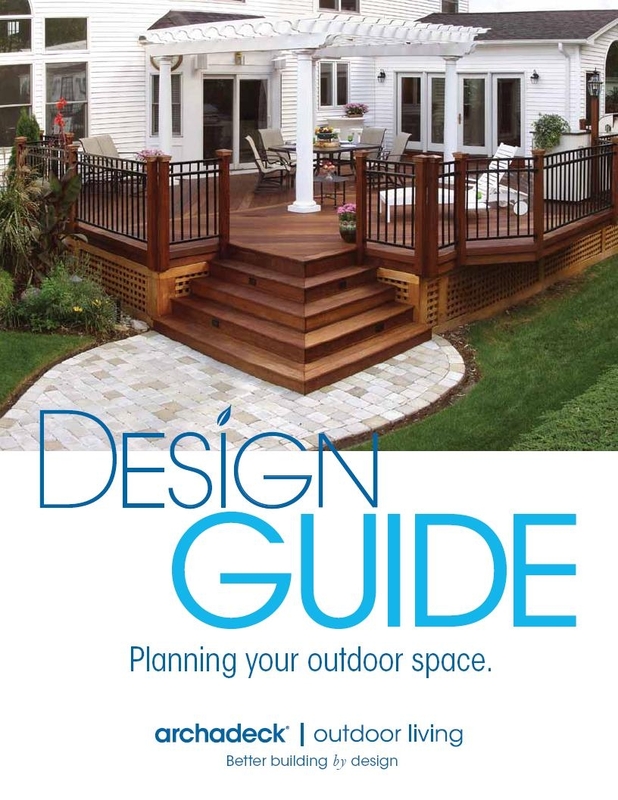 Our Design Guide is available for download via our web site. Or, call or e-mail us and we’ll be glad to send you a copy directly. 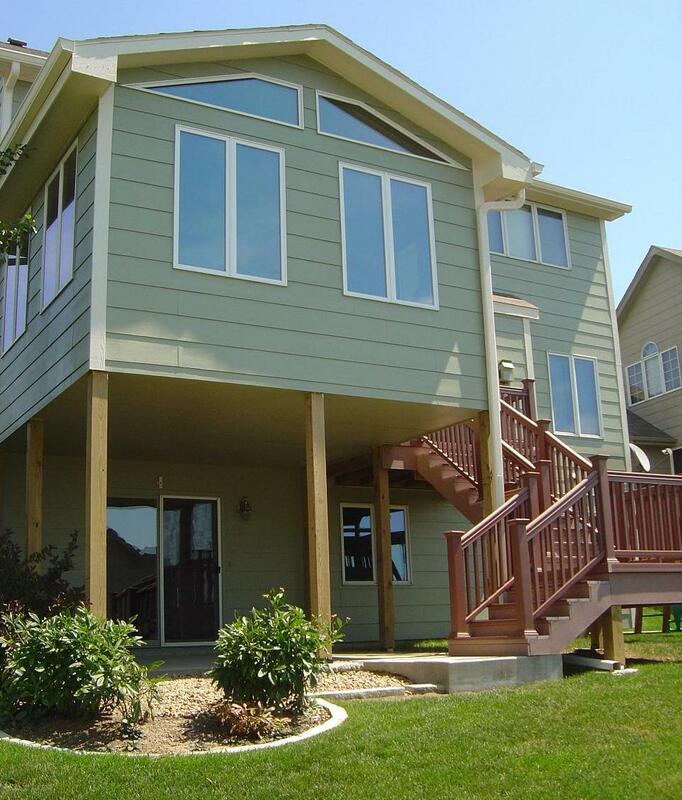 Pergolas…not just for the backyard: I’ve long thought there aren’t enough pergolas on the fronts of homes here in Central Iowa. A few years ago, I was on a business trip in North Carolina and noticed a fair number of front porch pergolas (that made it a business trip, right?). I’ve apparently been on a one-man mission to bring that style to the Des Moines area. And, I’m starting to make inroads! It’s a style that doesn’t fit for every home, but where it does…you can’t beat the “curb appeal” and the welcoming nature it offers at your front door. We completed our first front porch pergola over the winter…and I’ll have (nice) pictures up to show once things “green up” just a bit more. We’ve also got another front porch pergola design committed for construction later this summer. And a couple more on the drawing board! Stay tuned! Lets Get Stoned! (legally): Stone – vertically or horizontally – adds so much to your outdoor living spaces. Its another “thing” I don’t think there is enough of here in Central Iowa. Whether it’s a patio space (horizontal) or column wraps (vertical) or any number of other accessories (seat walls, firepits, fireplaces, outdoor kitchens, etc.) the textural addition stone – natural or man-made – adds to your space is very appealing. Stone is becoming more prominent in many of our combination projects because stone is a more natural, intermediate transition (often in the form of a patio) from the yard to the wood and wood-alternative deck, porch and shade structures we build. Because of this, we’ve got a growing, national relationship with Belgard Hardscapes and are looking forward to the support and resources they can bring to the Archadeck system much like TimberTech, Azek, Fortress (railing and fence) and Feeney (cable rail) do for our deck spaces. We’ve got a couple of projects we completed late last year and are about to be built this spring (as soon as the rain lets up) that we’ll post pictures of soon that exemplify this growing trend in outdoor living spaces. Stay tuned! TimberTech – Dare 2 Compare Road Show: TimberTech brought their 2011 version of their Dare 2 Compare road show to Des Moines last week. I had a little fun with this on our Facebook page, so rather than repeat that here…flip over to our Facebook page for that report. Whats In A Name? 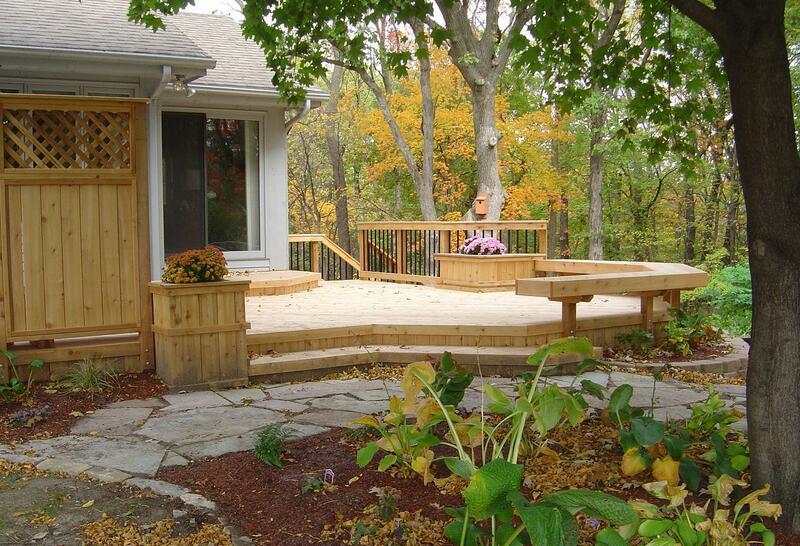 A Deck by Any Other Name is still an Outdoor Living Space. 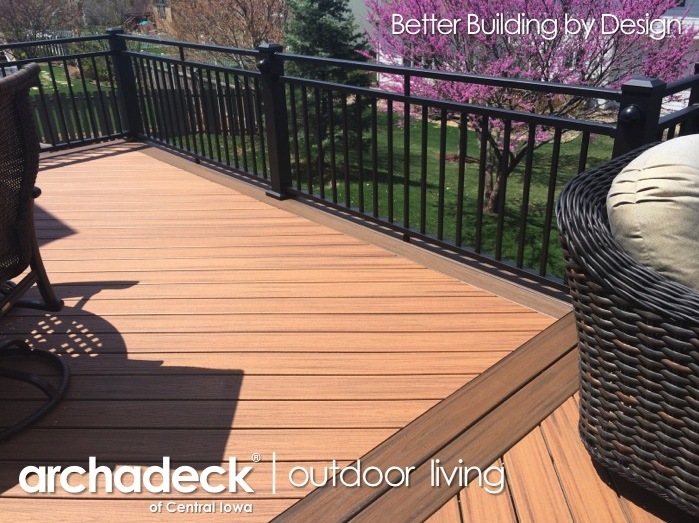 With a name like “Archadeck” or “Archadeck of Central Iowa” its pretty apparent that we build decks in and around Des Moines, Iowa. In fact, after doing this for over 30 years nationally and 13 years locally, our name has become so synonymous with decks and deck building that many folks think Archadeck is a deck board…a decking product…much like Trex, TimberTech, Azek and other prominent decking and railing manufacturers. A common opening line of introduction I hear at home shows is “My neighbor has an Archadeck…” (and that sentence usually ends with something like “…and they really like it.”). All that is good, but its also a double-edged sword. Many actors don’t like being stereotyped into similar roles or specific character types. But, success breeds success so its easy to get caught up in that. Even when actors do manage to avoid or break a stereotyped image, maybe one or two performances left such a lasting impact, that some movie goers (makers?) can’t see them as anything else…regardless of what “it” was. 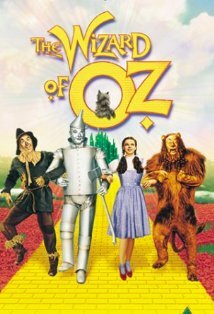 Go ahead, without looking, try to name one other movie Judy Garland was in besides the Wizard of Oz. To some extent, Archadeck battles this same issue. We started as a deck building company. We’ve become a darn good deck building company. 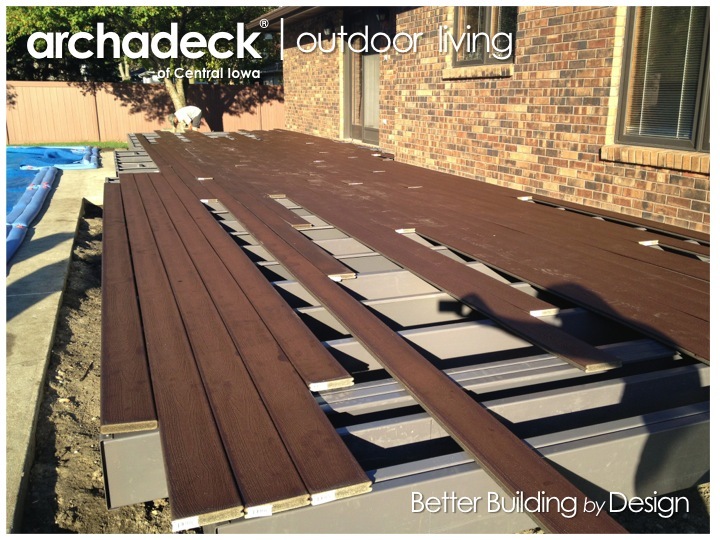 Our name says “deck.” Therefore, we are a deck building company. Whats in a name? Actually, quite a bit more. Archadeck is much more than a deck builder. For one, we don’t just build. We design…and then build. And manage the whole process for you. The design aspect of our business lays the foundation for the success of our projects and the satisfaction of our clients. A fair amount of design effort – custom design, in most cases – goes into our projects; our clients know what they’re getting and how much it will cost before a single spade is turned or board is cut…or even ordered. A fair amount of our time also goes into managing and coordinating the transition from a committed design to a completed project. For two, we don’t just design and build decks or manage just deck building projects. Spaces and Rooms and Accessories, Oh My! that try to convey the broader scope of what we do. 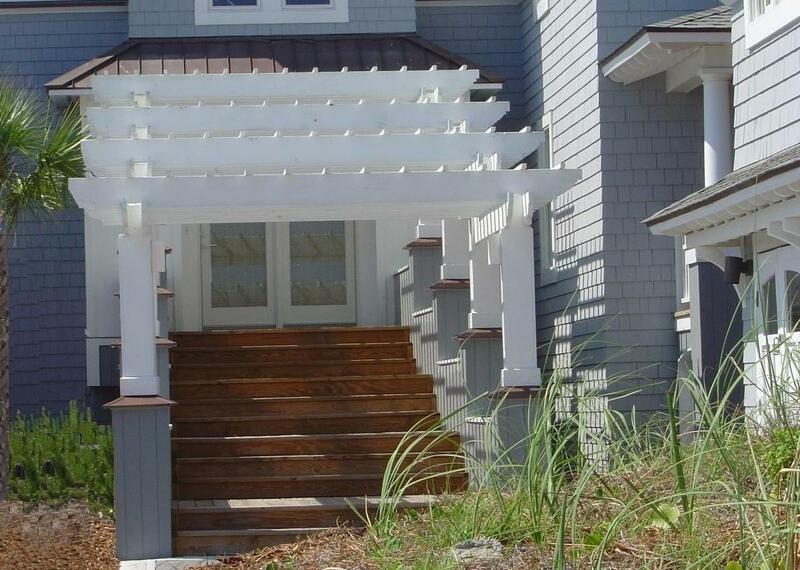 Our product list gets quite lengthy these days…besides decks, we also design and build screen porches, open porches, front porches, 3-season rooms, 4-season rooms, sunrooms, pergolas, gazebos, patios, outdoor kitchens, outdoor fireplaces…and more. Yes, we – Archadeck – do all of those…and more. Yes, we – Archadeck of Central Iowa – do all of those…and more…from Ames to Indianola, from Pella to Panora, all around the Des Moines area…and beyond. 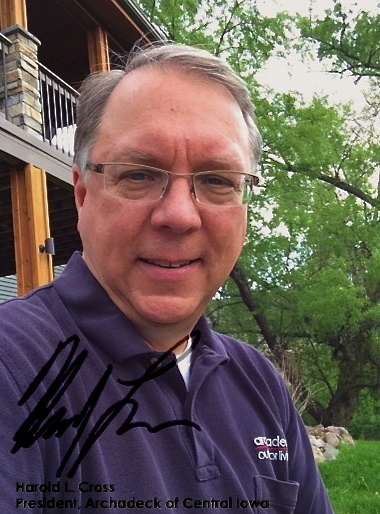 We have recently started and will continue over the coming months to take steps to more succinctly present what it is we – Archadeck – do and who we – Archadeck of Central Iowa – are. “Outdoor Living” is certainly a phrase that broadens our span and it certainly is applicable to us. But, its almost too broad…outdoor living what? And, everybody has jumped on that bandwagon. Walmart and Hy-Vee are two prime examples that come to mind; both now have “outdoor living” sections of their stores…or parking lots. But, we’re used to folks riding our coattails so we’ll take that as a compliment! 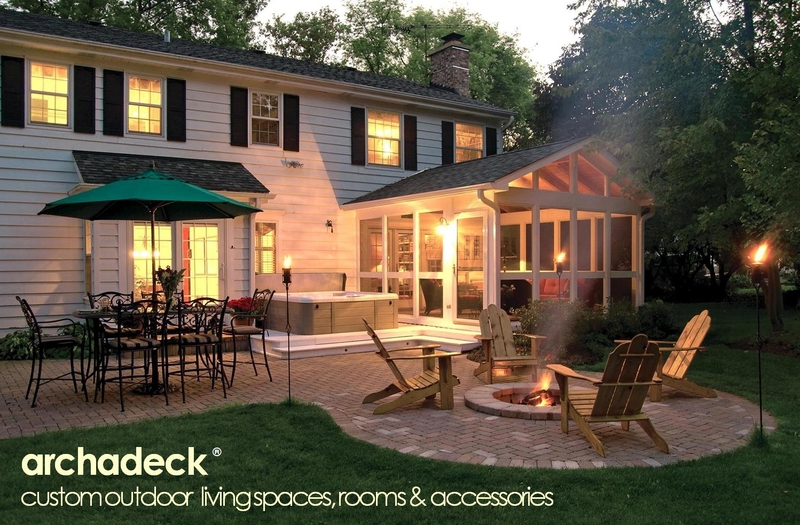 As for the “what,” try these for Archadeck’s answer to Outdoor Living: Spaces, Rooms and Accessories. 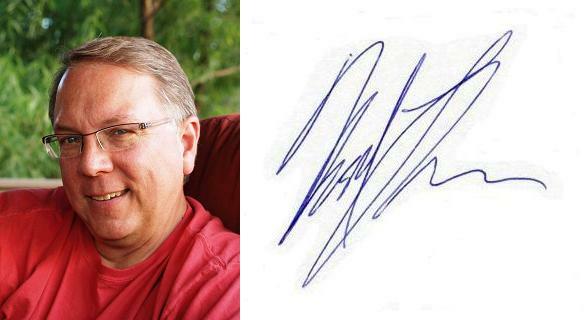 Over the coming weeks and months, you’ll notice this subtle change. 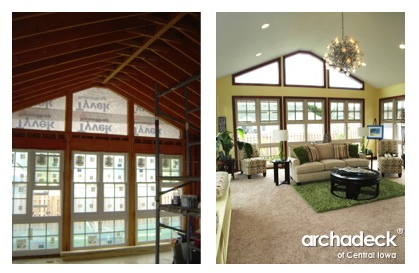 We’re still Archadeck, still designing and building decks, porches, multi-season rooms, pergolas, patios and more. 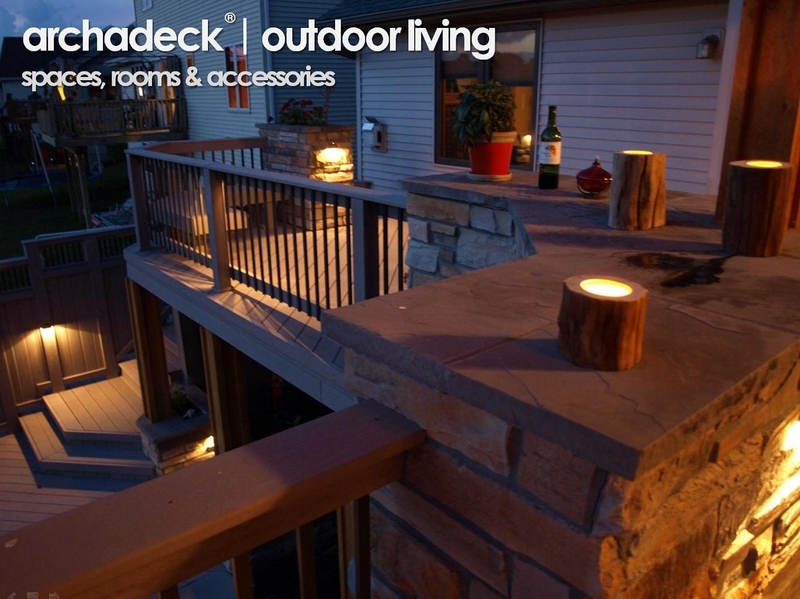 But, its Outdoor Living by Archadeck. Its Archadeck Outdoor Living. Its our Spaces, Rooms and Accessories for Outdoor Living. Our integrated, custom designs and managed processes bring it all together for you…from the foundation to the grill…from the deck boards to the windows. 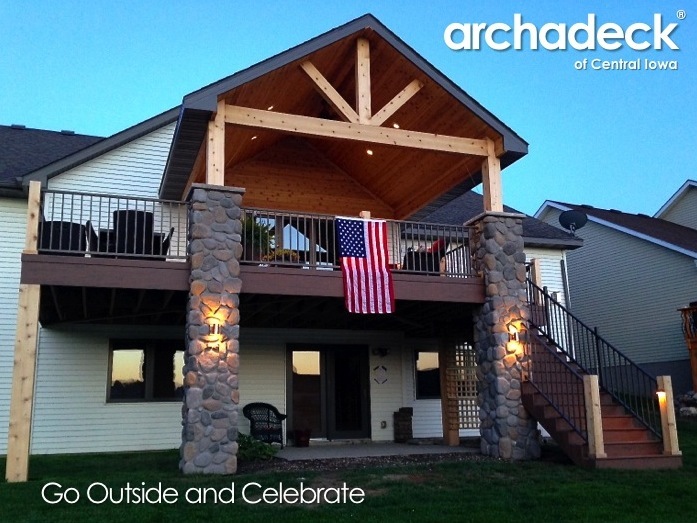 To learn more about the Archadeck Difference and our role in developing your outdoor living spaces, rooms and accessories, call us at 515-266-8844 to request a complimentary on-site or in-our-showroom consultation or visit our web site at central-iowa.archadeck.com and complete the online request form. 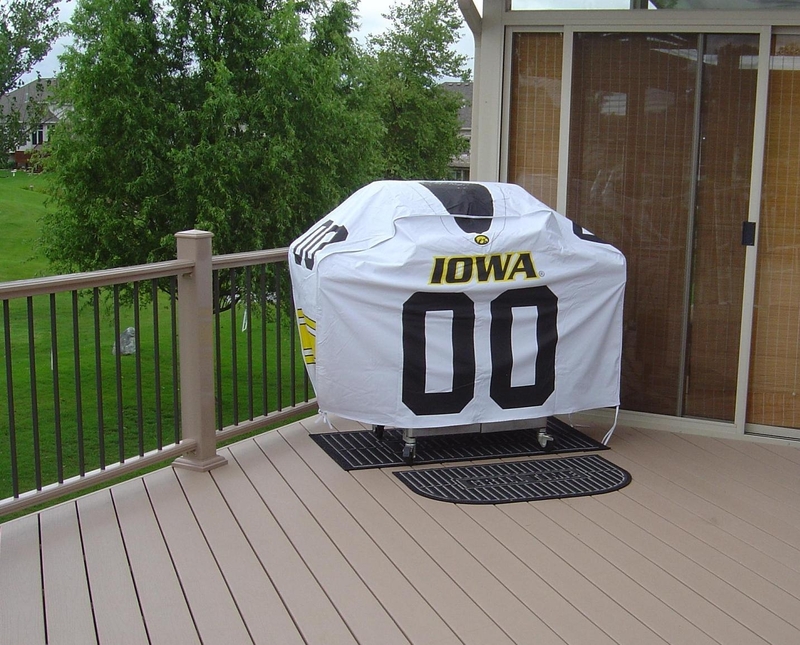 Who’s on your Deck, Porch or Patio for the Big Iowa-Iowa State Game? Its Big Rivalry Game Weekend in Iowa with the Iowa Hawkeyes hosting their cross-state rivals, the Iowa State Cyclones, this afternoon. 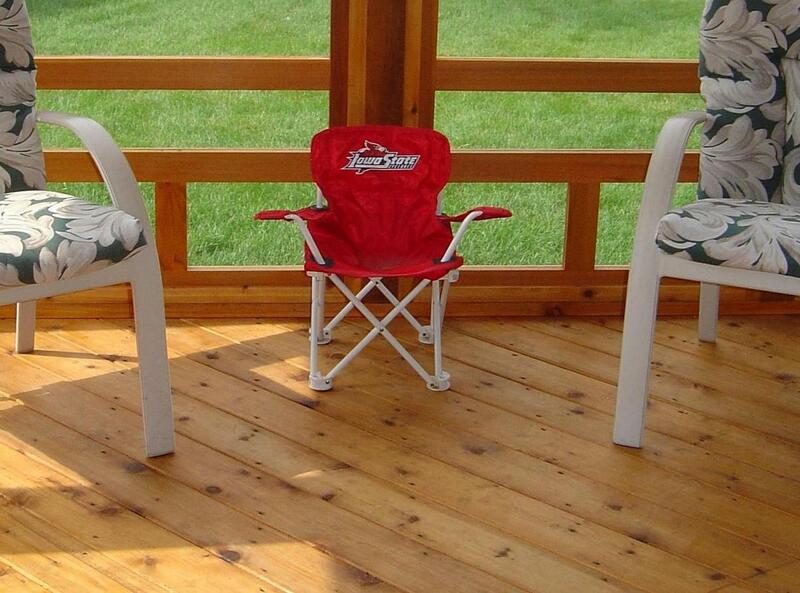 Its a tough ticket to get, so if you’re tailigating at home this weekend, Archadeck of Central Iowa wants to know…which team is on your deck, porch or patio? We know that Tim and Deb Ordal and their family in Ames have the Cyclones on their cedar screen porch we did for them in 2007. 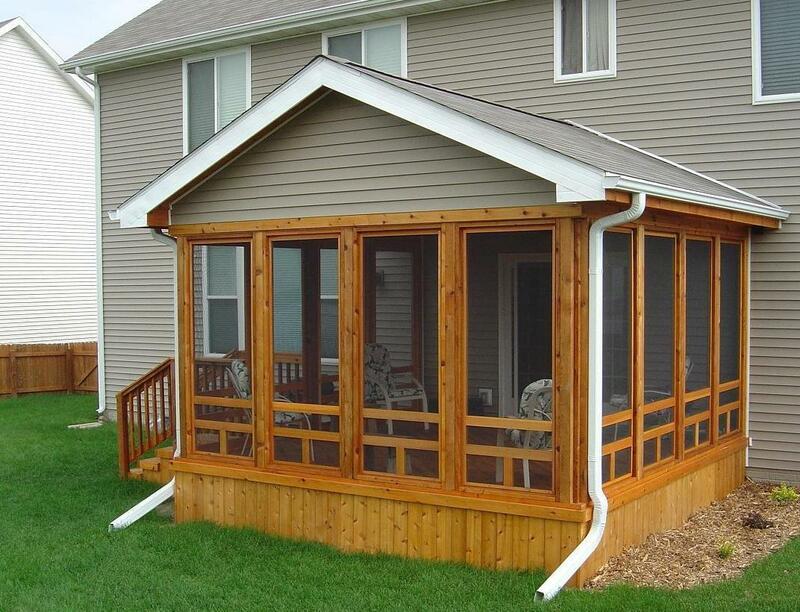 This 16×16 screen porch features a TV mounted in the upper corner of the porch. So, I’m sure the family – including the littler Cyclones – are gathered around cheering for their Iowa State Cyclones. Safer there than at Kinnick Stadium in Iowa City! Further south in Ankeny, Craig and Terese Fruendt and their family have the Hawkeyes on the Azek, wood-alternative deck we did for them. 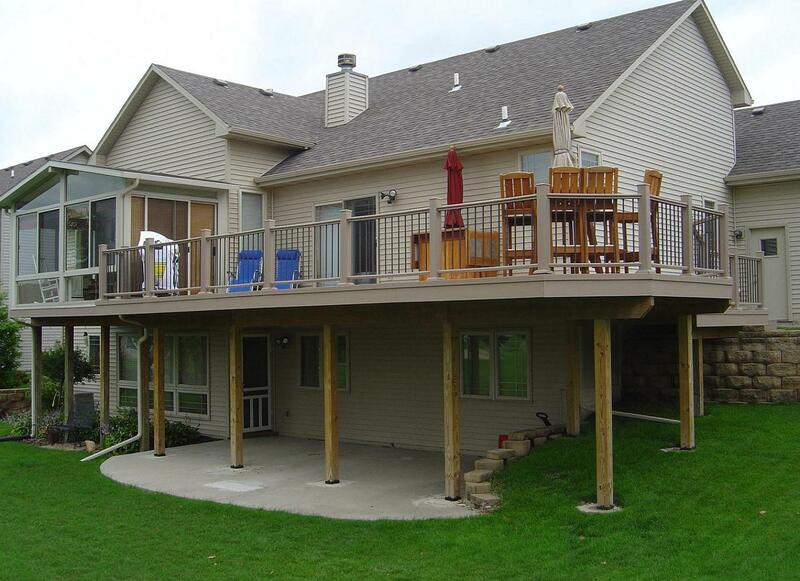 In 2008, this was one of the first, fully Azek-branded deck and railing projects in Iowa as we pushed Beisser Lumber in Grimes, their regional distributors and our national Azek partner to open up better Azek supply channels in to the Central Iowa area. So, now the Fruendt’s have an ultra low-maintenance outdoor living space (a growing trend in outdoor living spaces) for enjoying their beautfiful Briarwood golf course setting…and the big games! And, just so you know…we’re neutral on which team we’ll build for! Go Iowa…State of. Labor Day weekend. The Iowa State Fair is behind us. School is back in session. College football kicked off this last week. And, with good showings by both the Iowa State University Cyclones and University of Iowa Hawkeyes, the upcoming annual in-state rivalry game is sure to bring our state to a standstill this coming week. As all these things unfold, “Where did the summer go?” is a common mindset this time of year. Summer isn’t over yet. Technically, its summer until the Autumnal Equinox which occurs September 21st. Then its Fall. And, then there’s that Indian Summer thing. Labor Day is not a celebration of the end of summer. 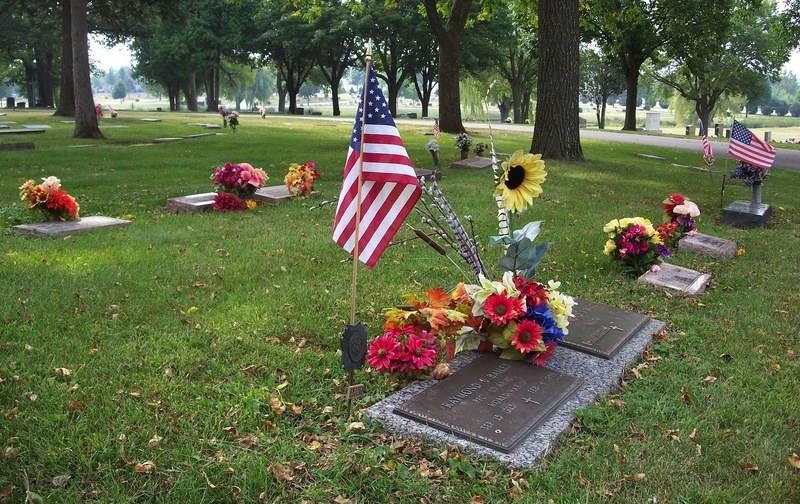 It’s a celebration of laborers…what this country is built on. Whether you’re a deck builder in Des Moines or Ames, a car builder in Detroit or St. Louis, a PC maker in Silicon Valley or Austin, this country was built on hard work. Short of sounding like a Chevy truck commercial, I think you can see what I’m getting at. We’ve worked hard to get where we are, lets celebrate that. Fall does not start when the Iowa State Fair ends. Fall does not start when school starts (although in some parts of the country, its closer). Fall does not start when the first football game is kicked off. Even when Fall does start, it’s a beautiful time to enjoy your home by living outdoors. Tailgate at home on your deck, porch or patio; no better time to put your grill or outdoor kitchen to use. Enjoy views of the colorful foliage from your multi-season room or deck. Flip on your natural gas outdoor fireplace to take the chill off the evening air while out on your deck, patio or porch. Or, put an extra log in your firepit….roast a few marshmallows. If you’ve got all those spaces and rooms and accessories to enjoy the Central Iowa outdoors with over the coming months – do it! Go Outside and Play! 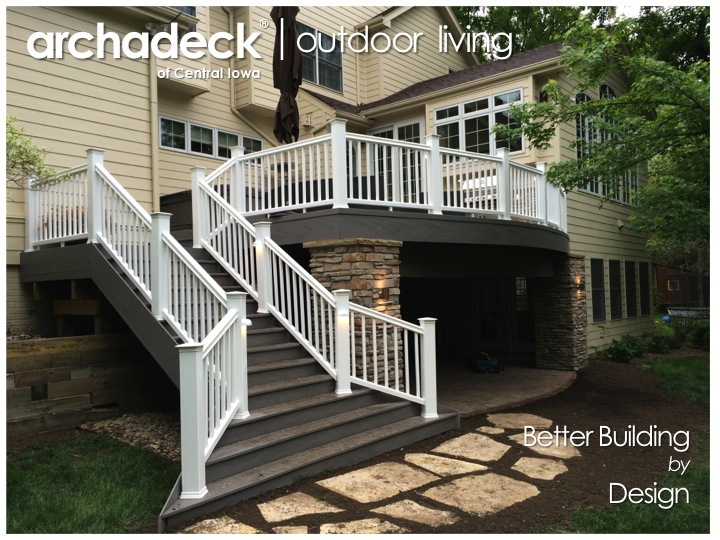 If you don’t have those spaces, rooms or accessories for optimal outdoor living, I’m also here to remind you that fall and winter are great times to have those designed and built for you by Archadeck of Central Iowa. We think “outdoors” year-round. We do have some mid-late Fall building opportunities still available and we do build thru winter, depending on the project and Mother Nature’s mood. In any case, we can have you out on your new deck for that first nice weekend next Spring…which starts with the Spring Equinox on March 21st. 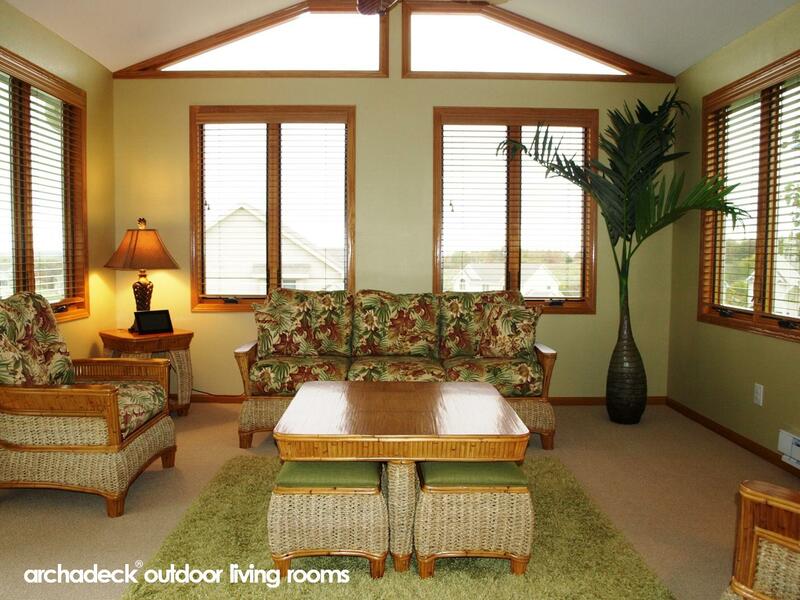 Or, if it’s a sunroom or 3-season or 4-season room you desire, maybe you can watch the Iowa Hawkeyes’ and ISU Cyclone’s football bowl games in there. Or, the Super Bowl. 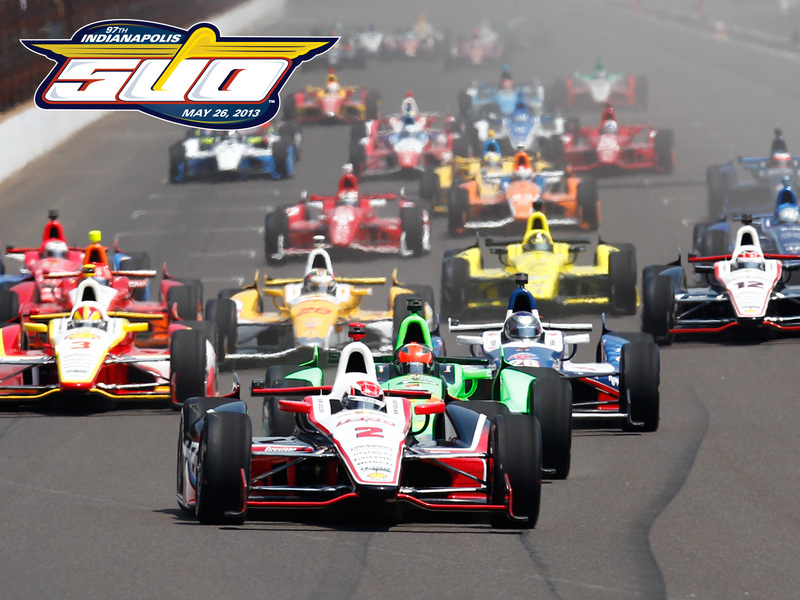 Or the Daytona 500. Or maybe just a nice, mid-winter movie-and-popcorn night. 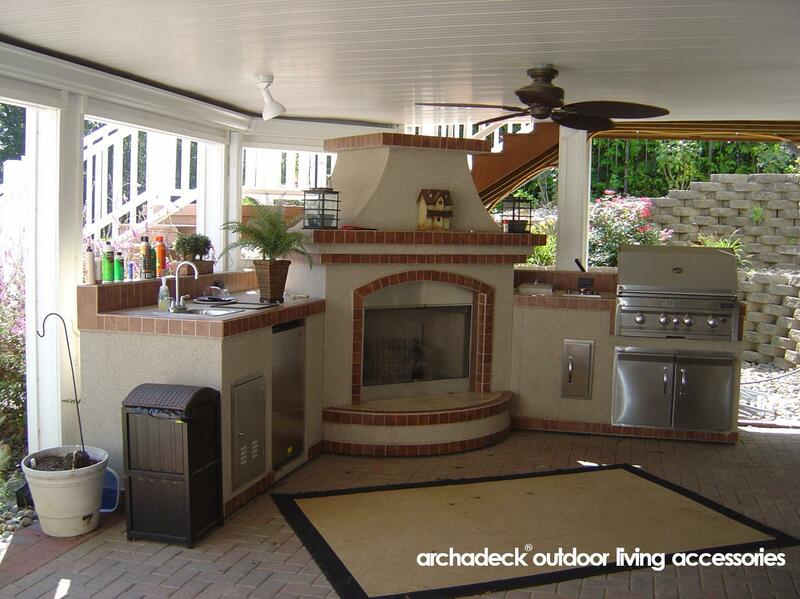 And that outdoor kitchen…configured properly, it can be used year-round as well. It’s still summer, Central Iowa! 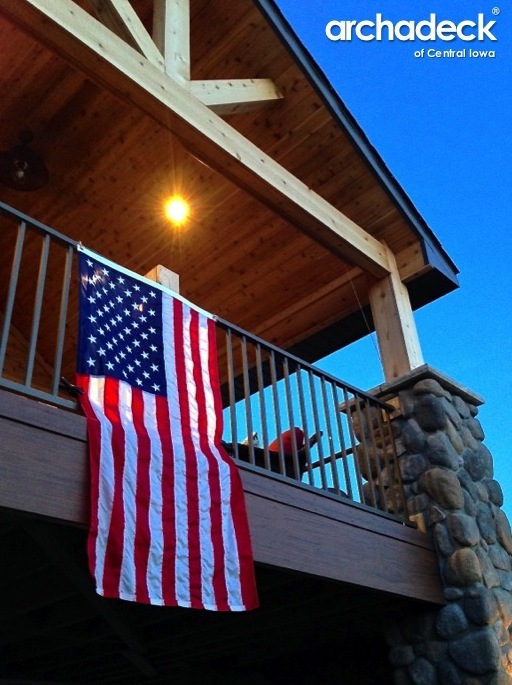 Plenty of time left to enjoy our great outdoors…and to build (labor) outdoors. 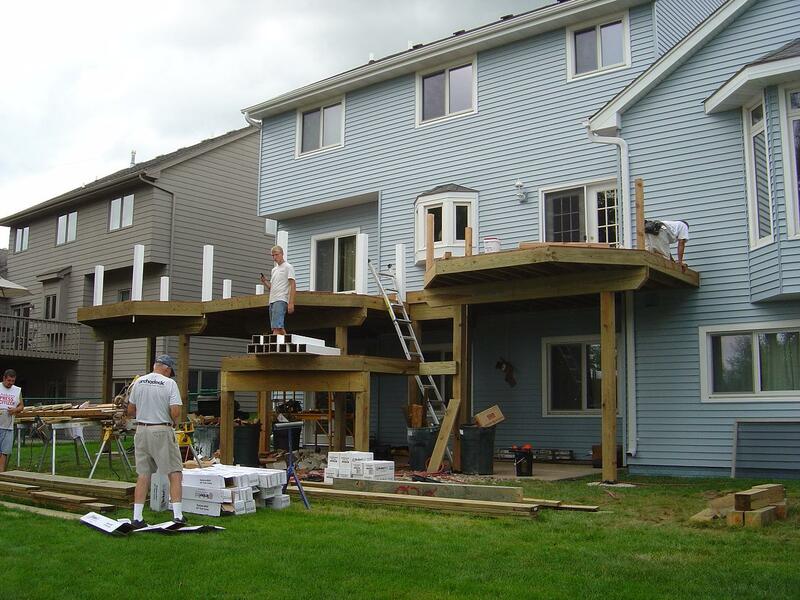 Plenty of time to have your deck, porch, patio and other outdoor living spaces, rooms and accessories upgraded for more enjoyment and value. 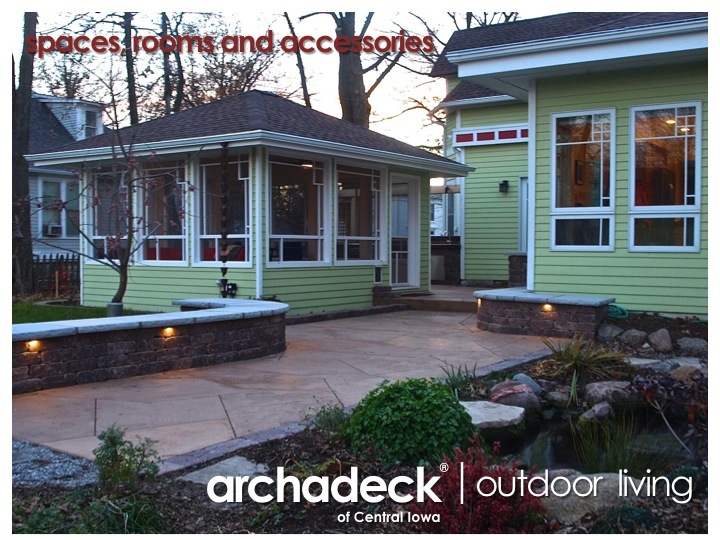 Archadeck of Central Iowa, your custom outdoor living space developer, can show you how; contact us to learn more.